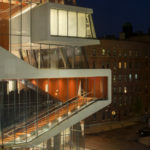 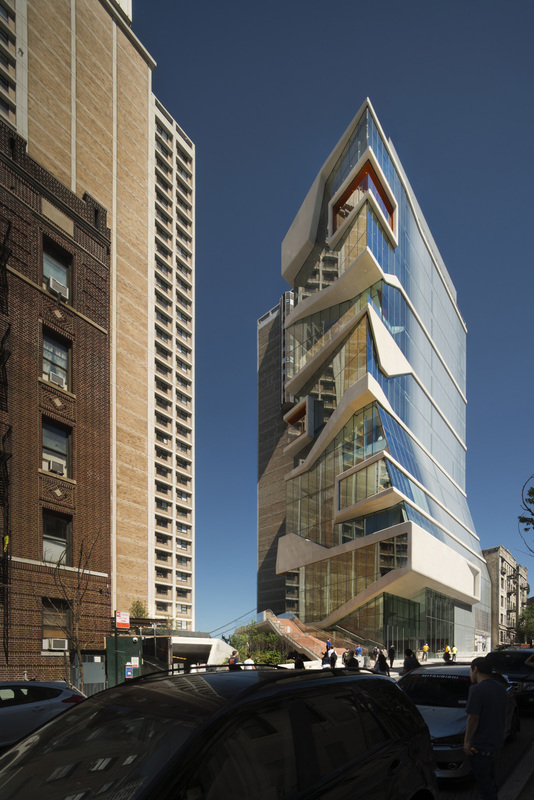 The Vagelos Education Center is a new state-of-the-art medical and graduate education building at Columbia University Medical Center. 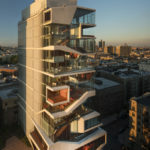 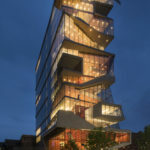 The building, designed by Diller Scofidio + Renfro (DS+R) in collaboration with Gensler as executive architect, is a 100,000-square-foot, 14-story glass tower that incorporates technologically advanced classrooms, collaboration spaces, and a modern simulation center to reflect how medicine is taught, learned, and practiced in the 21st century. 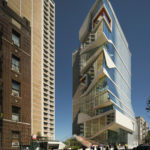 The design seeks to reshape the look and feel of the medical center and create spaces that facilitate a medical education. 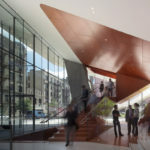 The project, which broke ground in September 2013, comes amidst a wider campus revitalization plan for CUMC that involves increases to green space, renovations to existing buildings, and the construction of new facilities. 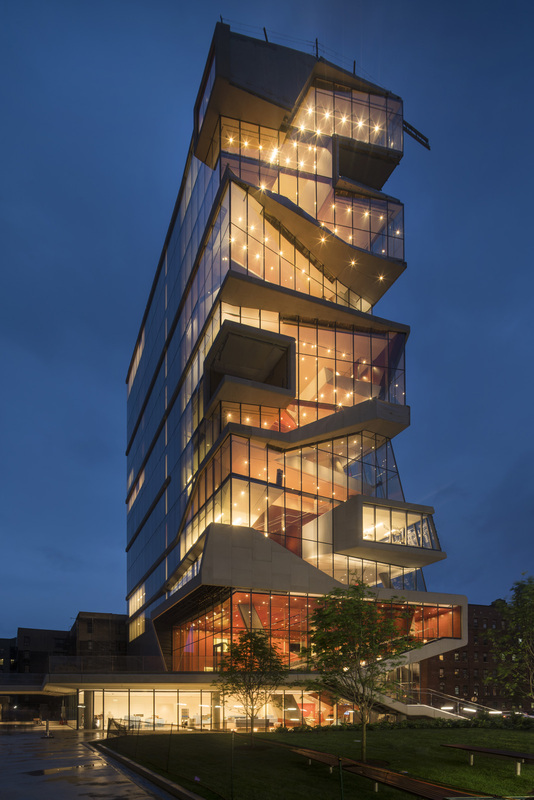 All new construction and renovation projects within this plan work toward the goal of minimizing CUMC’s carbon footprint and reducing greenhouse gas emissions by 30 percent by 2025. 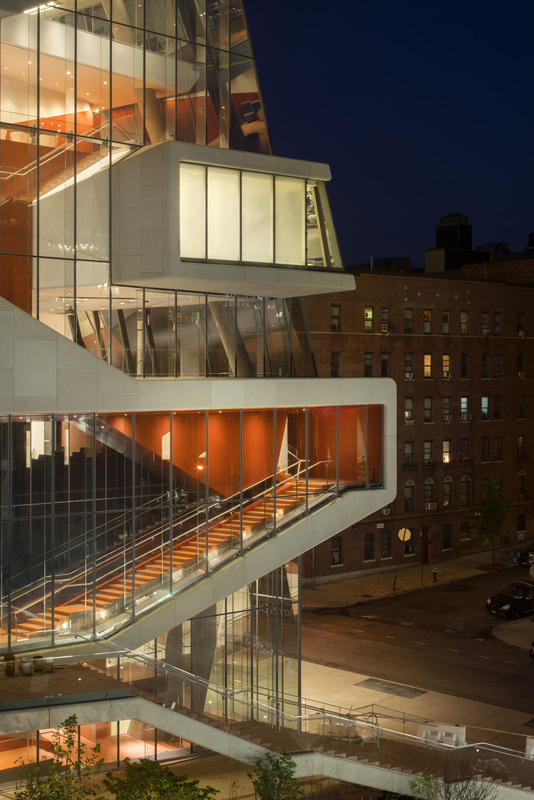 On a larger scale, the Vagelos Education Center will help to define the northern edge of the campus, providing a bridge to the surrounding Washington Heights community. 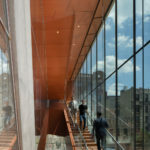 This is reflected in the most captivating feature of the building: A highly transparent south-facing 14-story “Study Cascade,” designed to be conducive to team-based learning and teaching, that opens onto south-facing outdoor spaces and terraces. 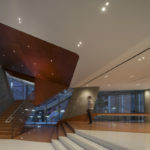 The organization of the interior spaces produces a network of social and study “neighborhoods” distributed along an exposed, interconnected vertical staircase that extends the height of the building. 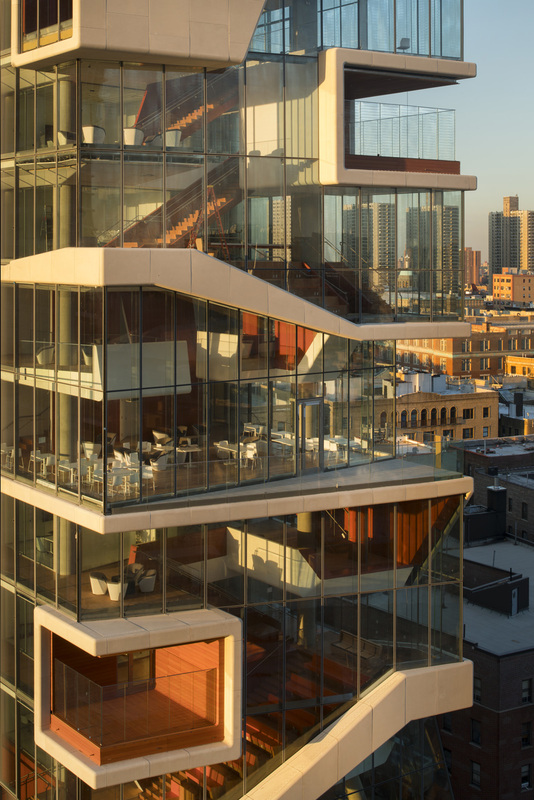 DS+R’s design takes advantage of an incredible view of the Hudson River and the Palisades. 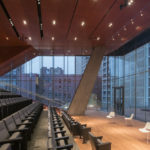 The building is composed of cantilevered post-tensioned concrete slabs cast with Cobiax void formers to achieve a lighter weight long span system. 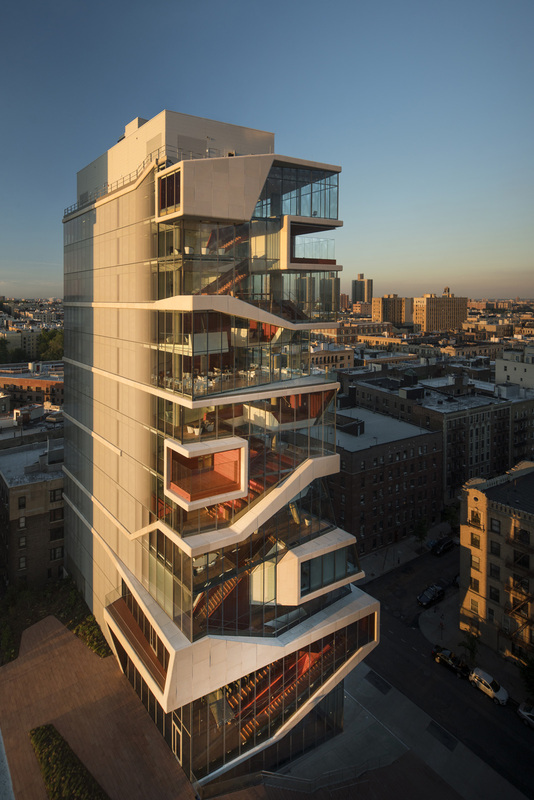 These slabs form the basis of the Study Cascade, and spring from a site-formed reinforced concrete core providing structural shear capacity for the building. 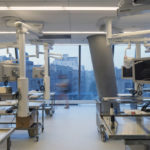 The vertical core programmatically divides the education center into two halves: a south-facing active collaborative zone, and a north-facing series of specialized spaces that include classrooms, administrative offices, and a “Simulation Center” of mock examination and operating rooms. 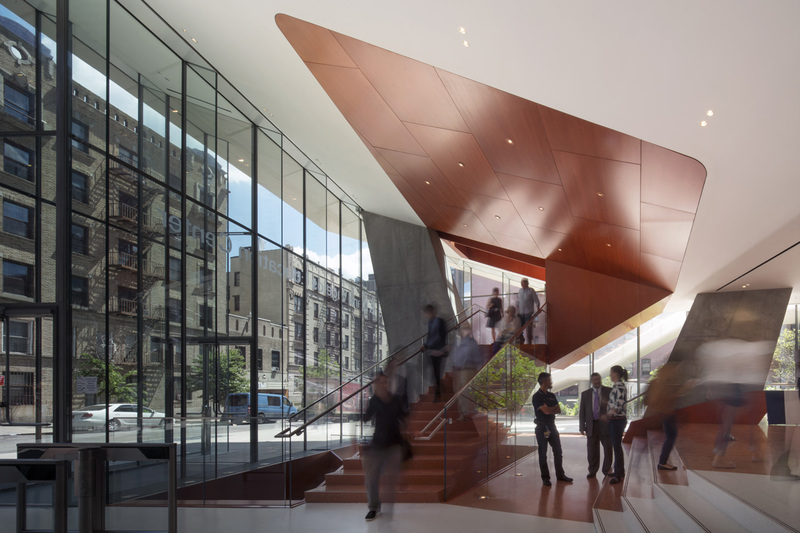 The facade system works to visually express these two types of spaces from the exterior. 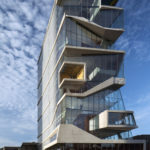 The Study Cascade reads more as a continuous unfolding of the ground plane in large part due to a highly transparent stick-built curtainwall system that incorporates glass fin supports, low iron glass, and a low-e coating. 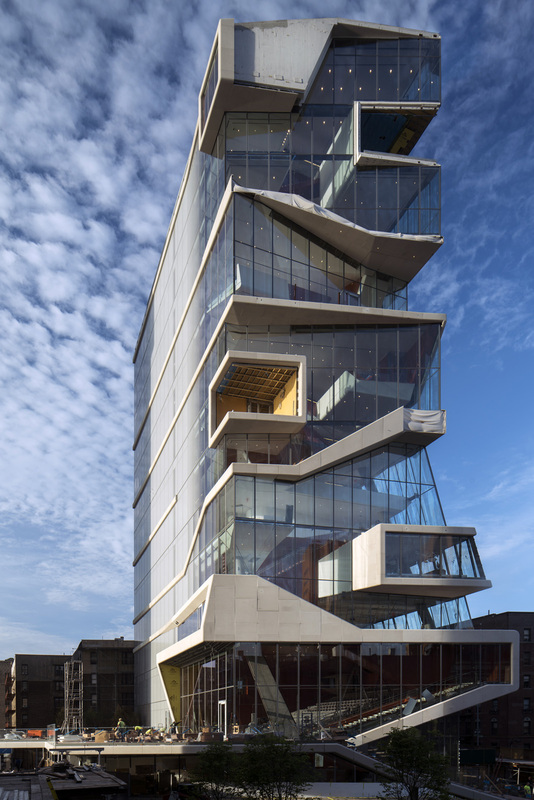 GFRC paneling follows the trajectories of the formal folds of the slab edges, further defining each interior zone. 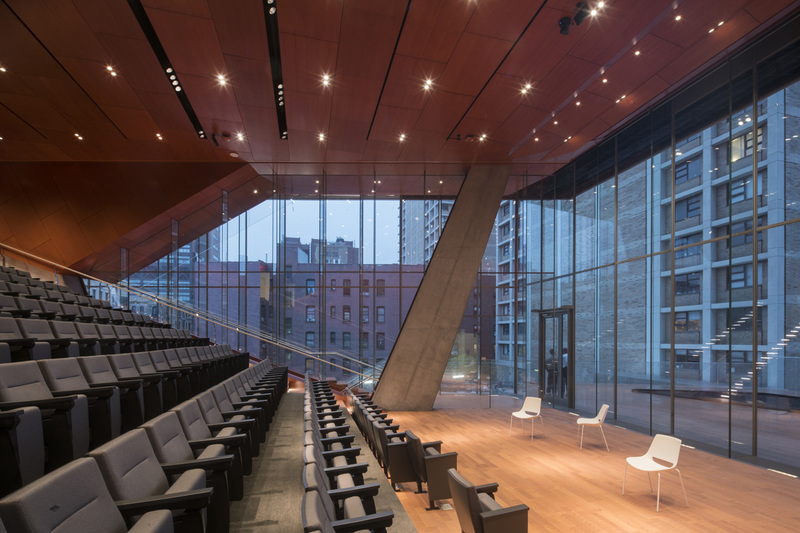 Around the side and rear of the building, at the location of specialized educational spaces, the slabs normalize into a more typical repetitive spacing, and are clad with a unitized aluminum mullion curtainwall integrated with GFRC elements to provide a more controlled day lit environment. 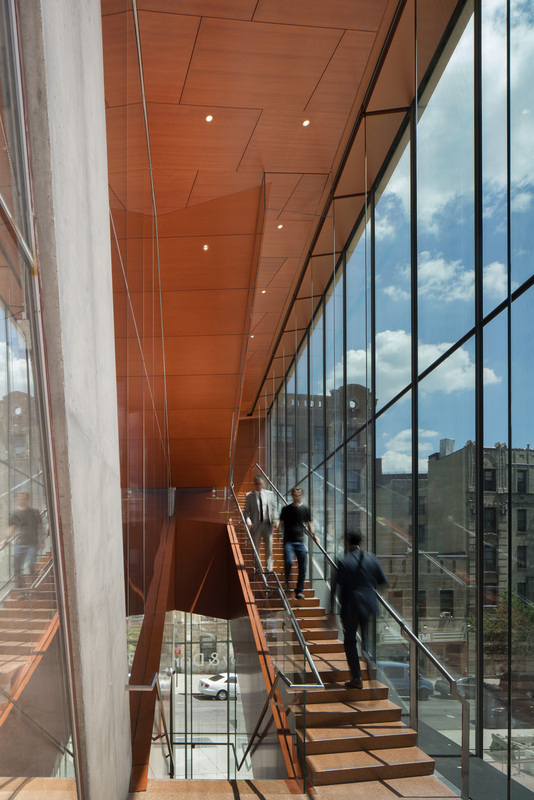 Ceramic frit glazing, set in one large gradient pattern, transitions from transparent to opaque along the side elevation, filtering and diffusing sunlight while mitigating solar gain. 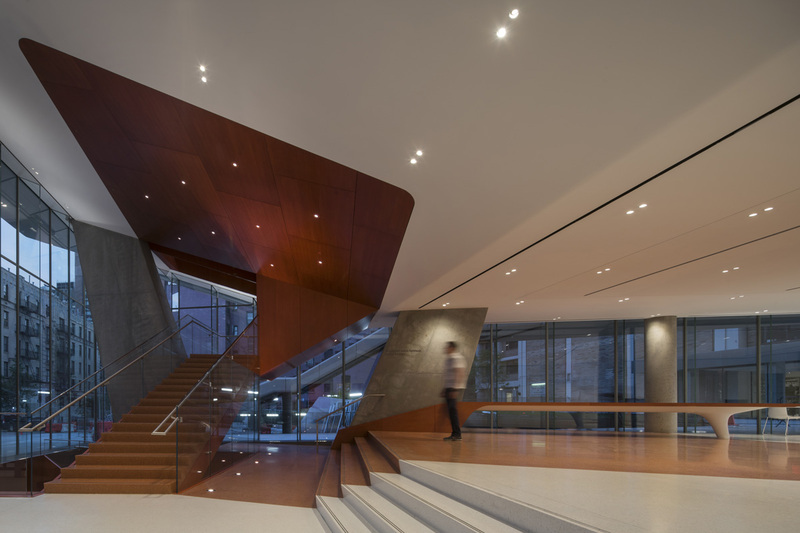 Targeting LEED Gold certification, the building integrates a range of sustainable features, such as locally sourced materials, green roof technologies, and an innovative mechanical system that minimizes energy and water use. 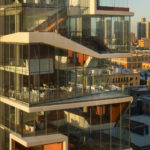 In addition to specialized glazing coatings and assemblies, the facade incorporates both fixed and operable shading to optimize the regulation of daylighting and solar gain by program area.